Now that spring is here (albeit some days in name only), it's time to think about making fresh, light veg-centric dishes. 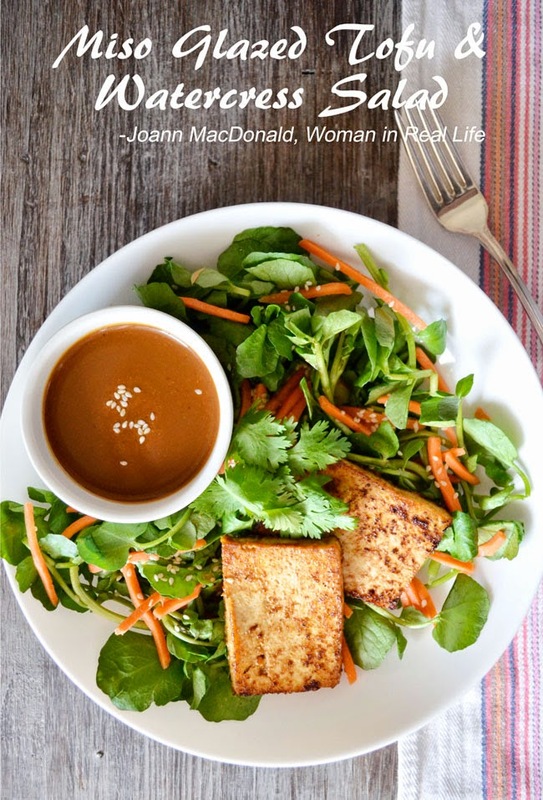 Like this Miso Glazed Tofu & Watercress Salad (which also happens to be a great addition to your Easter meal). I created the recipe after I had the pleasure of shopping at McEwan recently. This gourmet grocery store is a foodie's dream - a culinary shopping adventure like no other. With a selection of specialty and hard-to-find items unavailable anywhere else in Toronto, McEwan is rich with recipe possibilities. 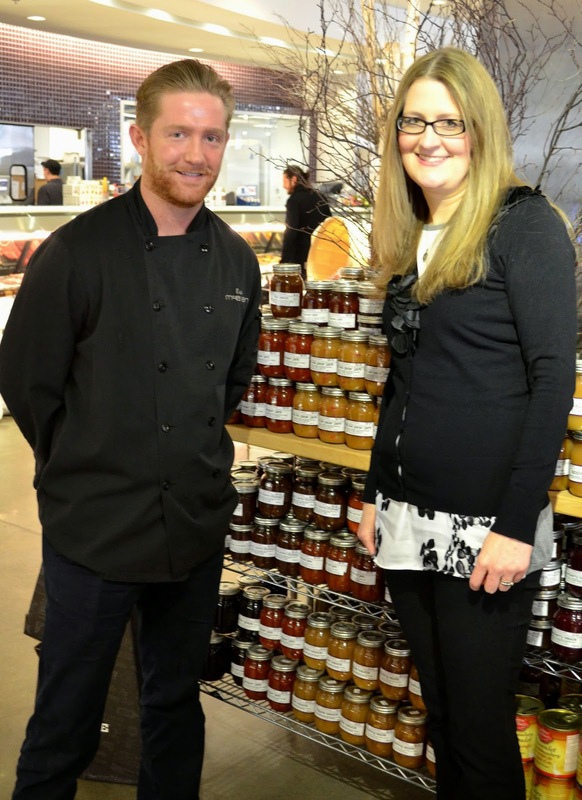 I toured the shop with Manager Eric McEwan, who introduced me to McEwan's Own, a line of specialty food items. With sauces, jams, dressings, pickles and all kinds of other goodies, McEwan's Own products make dinner preparation simple. And I'm all for simple dinner prep! Inspired by celebrity chef Mark McEwan's celebrated restaurants - Bymark, NORTH 44, ONE and Fabbrica - McEwan's Own gourmet products help you to create a memorable meal in your own kitchen. If you aren't in the mood to cook, McEwan also offers a range of healthy, delicious prepared dishes, created in the store's own upstairs kitchen and catering facility. Hundreds of items are made fresh daily under the watchful eye of Chef Shen Ousmand. Chef Shen was kind enough to share some of his expertise with me, recommending many innovative ways to use the McEwan's Own products I picked out. In fact, I'm looking forward to preparing a roasted butternut squash salad with McEwan pepper jam very soon! 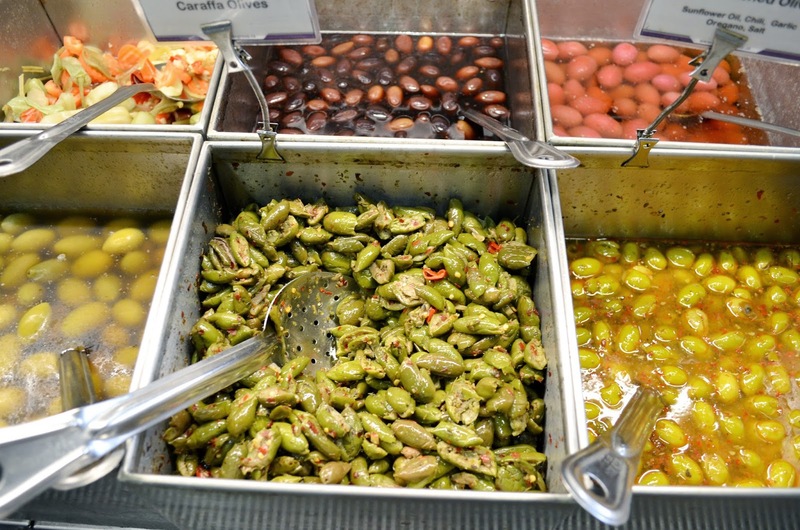 With all of the fine food options available at McEwan, like these lovely olive varieties, I feel like holding a springtime party! The store's sumptuous dessert options include a range of hand-painted (and incredible!) chocolates. There is a lovely salad bar, too, and lots of fresh fruit options - both cut and whole. One thing you can't help but notice at McEwan is that every item is carefully selected and artfully placed. No second-rate produce here. There's even a sampling station where you can try out a selection of fine oils and vinegars. 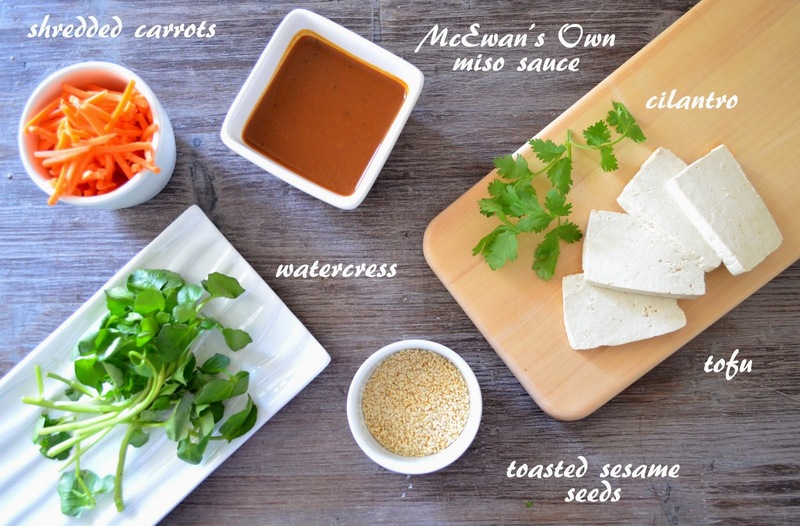 Although it was difficult to choose, I settled on McEwan's Own miso sauce for my first McEwan-inspired recipe. I set out to create a recipe that is super simple, requires few ingredients, can be whipped together in a flash and yet is gourmet enough to grace a special meal. The Miso Glazed Tofu & Watercress Salad that resulted is a suitable starter or side salad, but the tofu makes it hearty enough to serve as an entree for vegetarians. Once you have plated the watercress and carrots, all this recipe requires is quickly glazing the tofu slices with the miso sauce and cooking them two minutes per side in a hot pan. Dress the salad with some more miso sauce thinned out with water, sprinkle on sesame seeds, garnish with cilantro, top with tofu and you are ready to serve! Wash watercress and spin dry. Divide over 4 individual serving dishes. Sprinkle shredded carrots over each serving. Blot tofu dry with a paper towel and cut into 8 slices, each about ¼-inch thick. Brush 4 tablespoons of McEwan miso sauce over the tofu slices. In a large skillet set over medium-high heat, cook tofu slices 2 minutes per side. Remove from heat. In a small bowl, whisk together 2 tablespoons of McEwan miso sauce and 1 tablespoon of water. Drizzle dressing over each salad. Place 2 slices of tofu on each serving. Sprinkle with sesame seeds. Add salt and pepper to taste. Garnish with cilantro. Serve and enjoy! The store looks awesome and the recipe looks easy, tasty and presents so well. Wow my mouth is watering just looking at these pics. This store looks amazing. Your food always looks so great and is so inspiring. That place looks like paradise!! And the tofu looks amazing. It certainly makes grocery shopping easier when there is such an abundance of fresh items, doesn't it? Thanks Ruthie. Have a great Easter weekend!